Justice VR Krishna Iyer hit a century and retired on December 4th of this dying year– nineteen days after the city of Kochi in Kerala celebrated the landmark. The other landmark he left behind was of seven hundred memorable Supreme Court judgments – a century for each year of his tenure. 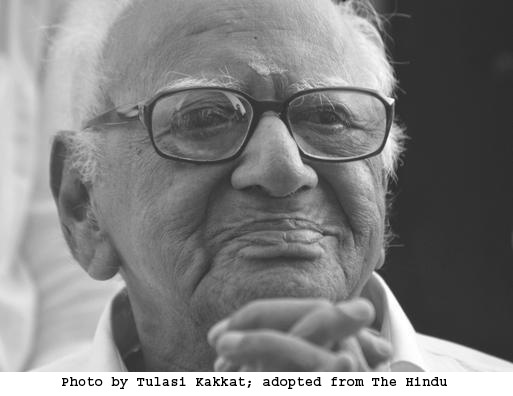 As a young lawyer apprenticing with his father, Krishna Iyer represented the cause of peasants and poor workers. He was probably the only judge (though politicians may be plenty) in the history of India who went to jail as a young man (for protesting against torture in interrogation), and the only one who served as a minister in the first elected Communist government. EMS Namboodiripad sent a special mission in the person of irresistible Gowri Amma (Then Gowri Thomas) to persuade this independent member to join the ministry and handle the burden of a number of portfolios including law. When Nehru ignored his advice not to dismiss a constitutionally elected government, he (nehru, the great democrat) set a bad precedent for the central government of every shade to follow without a trace of conscience. Many branded him a communist. He was an ardent believer in afterlife, so I do not think that dialectical materialism could have appealed to him. He lost his wife Sarada when he was sixty and believed that he could communicate with her through a “medium”- the wife of a brother judge. His wife, after she was dead for some time, warned him not to drive his car because it could lead to an accident – and it came true, he said. Out of his 100-odd literary works (another century!) one is on Afterlife. With all my admiration for his judicial wisdom and sense of fairness and justice, I was shocked when as the vacation judge of the Supreme Court in 1975, he allowed Indira Gandhi to retain prime ministership of the Country without the right to vote. She had been disenfranchised by a Court, and unless that sentence was quashed by a larger bench later, she had no right to continue. A minister had to become a member of Parliament within six months if he or she was already not a member; Indira Gandhi’s membership was taken away by a legally constituted court and she was not fit to continue or to seek reelection as the law stood at that time. As a junior vacation judge, he could have given a stay till the vacation was over and a regular bench was constituted by the Chief Justice. Krishna Iyer was not the kind who ran away from making a decision. Indira Gandhi’s lawyer Nani Palkhiwala warned him of the terrible consequences that could follow if the stay was not granted. There was a surging crowd outside sloganeering in favour of Indira Gandhi. Undaunted, but not exactly unmindful of what could happen if the interim appeal was unceremoniously dismissed, Iyer wrote a partial stay at 2:30 AM in the morning. Indira Gandhi grabbed the chance to thwart Constitution and subvert law with retrospective effect. I was a witness to how she misused every government machinery – public transports, cars, government employees et al – to hold demonstrations against the judgment in the road circle outside her house. A rubber stamp parliament decided that, with retrospective effect, the Prime Minister cannot be convicted for any offence. She declared Emergency which took away the rights of citizens. Democracy stood insulted and injured; questioning intelligentsia was jailed; ordinary citizens tortured and killed. India suffers from the fallout of her action till today. A crime by an acquitted criminal cannot be blamed on the judge who acquitted her : I do not recall Iyer reacting to the criticism on that judgment either way. Iyer was not on the Supreme Court bench that ruled that the citizen had no right – by implication right to life – under the Emergency. If he was there, I am sure he would have sided with the other brave heart, Justice HR Khanna. Khanna, though senior, was superseded by Justice Bhagwati for toeing Indira Gandhi line (which, according to him, was done on the dictate of Sathya Sai Baba) and Iyer never stood a chance though he served as a judge of the Supreme Court for seven years. While there, among many of his historic judgments, he stopped the practice of handcuffing suspects and convicted prisoners. Judicial activism began with Justice Krishna Iyer. I believe his legacy had a great impact on the judges who came later. Shortly before his death, unable to walk on his own and helped by two men, he visited a woman tortured by police and helped her out of her predicament and further persecution by the same police. In 1999, before accepting the Padma Vibhushan award, he phoned the President – KR Narayanan – if the award would mean he couldn’t criticize the Government. Certainly not, said the president, which is how Justice Krishna Iyer accepted his Padma Vibhushan – the highest civilian award. Iyer, of course, never let up his criticism of the government, any government. A year ago, he sat on a dharna demanding a cancer hospital for Kochi. There was no subject of human interest that was not in Krishna Iyer’s kitty. Though he held no executive power, he had done much for the improvement of his adopted city, Kochi, and every one there –fisherman, vegetable vendor, sportsperson, lawyer, judge, writer – knew him, and was grateful to him for one or another reason. His one hundredth birthday celebration turned out to be a citizen’s celebration. “I was deeply touched by a photograph of Justice Iyer in The Hindu published after he died as a reminder of the man he was. There he was being assisted by his care givers, one on each side, unable to stand on his own, visiting a woman victim of police torture. It brought tears to my eyes, he made old age and disability vanish in that one moment.”. Iyer described himself an anaemic enemy of the existing order trying to make feeble attempts at changing it, Perhaps those attempts were not all that feeble; changes he did make many; anaemia came to him only during the last days when he suffered renal failure. His house in Ernakulam is named Sat Gamaya – go on the right path. VR Krishna Iyer never retired while he was here with us. If there is an afterlife as he believed there is, you would find an activist working furiously up there, giving the angels a lesson or two on justice and fairplay, forcing Satan to put out his furnaces. Being something of a doubting believer in afterlife myself, and not hoping to be a centurion, I am looking forward to meeting with Vaidyanathapuram Rama Iyer Krishna Iyer some time not far too distant..
Next ›OH, TO BE BLACK IN AMERICA!